From its origins as a “torpedo boat destroyer” charged with hunting down enemy small craft and protecting battleships from torpedo attack, by the end of the First World War the destroyer had evolved into a larger and much more capable warship. Most fleet destroyers of the Great War displaced about 800 tons, with three or four guns and two to six torpedo tubes. The Russian Novik, launched in 1911, broke from this pattern. A much bigger vessel (1,280 tons), she could make 36 knots as her designed speed and at a special trial in 1913 after some modification she ran at 37.2 knots and claimed the title of world’s fastest warship. She carried much heavier armament than foreign destroyers. The Imperial Russian Navy built classes of big destroyers for both its Black Sea and Baltic fleets, but most other nations retained their 800-ton designs. The German Navy built a handful of large boats for its own use and German yards built a few for export to Argentina, while the Italian Navy built several classes of large destroyers classed as “esploratore” and likewise exported several to Romania. A class built in quantity. Four-four flush-deckers in the Panama Canal Zone, 1934. The United States Navy, however, adopted the Russian lessons whole-heartedly. In 1911 the Cassin class of 1,000-ton destroyers was authorized, replacing the previous 750-ton Paulding type. Like Novik, they carried four four-inch guns and eight torpedo tubes, but still had the relatively low speed of 29 knots. The Caldwell class introduced a new “flush deck” hull form rather than the traditional “broken forecastle,” which was thought to give better sea-keeping at the price of weaker hull strength. The huge American program of 1916 called for a maximum fleet speed of 35 knots, the design speed of the Omaha-class scout cruisers and Lexington-class battle cruisers. A new destroyer would have to match that speed, and would also need long range for anticipated operations against Japan across the wide spaces of the Pacific Ocean. The Wickes class was a Caldwell with a larger power plant, capable of 35 rather than 30 knots but carrying the same armament of four four-inch guns and twelve torpedo tubes, and with a very similar outward appearance. They completed with two dept-charge racks, and had a standard crew of 105 men. Fifty of them were ordered as part of the 1916 program, but United States entry into the First World War in April 1917 caused this to be increased to 111. Destroyers had turned out to be uniquely useful in combating enemy submarines; not surprising given that submarines of the era were essentially torpedo boats that could briefly submerge. Like many other wartime mass-production programs, they became known as “Liberty” destroyers. 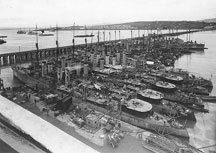 Eleven shipyards participated in the program, and details differed between ships built at different yards, particularly regarding their machinery. Boats built at Bethlehem Steel’s Union Iron Works had Yarrow boilers and were noted for much shorter endurance than their sisters (about 2/3 that of destroyers built in other yards) due to very poor fuel economy; the boilers were also found to deteriorate very quickly in service. None of the Wickes class made their projected endurance figures, however, and the design was modified to increase both fuel stowage and efficiency. The Clemson class had about 35 percent better endurance on average, although because of the varying quality of shipyard work some Clemsons actually did slightly worse than the best of the Wickes class. To balance the big German destroyers with 5.9-inch guns, the Clemson class had its decks strengthened to carry five-inch guns but only five of the 156 boats built actually received these weapons. Two others were given double mounts for their four-inch guns. The Clemson design had its aft four-inch gun on a raised platform; Wickes-class boats were modified to the same standard. Four Wickes-class boats having their aft gunnery position modified to Clemson standards. Mare Island Navy Yard, 1921. Very few of either class were completed in time for the Great War, and none of them saw combat as fleet destroyers. With 273 total boats available, there was no urgency to build new destroyers after the war and no new destroyer design would be prepared until 1934. Sixty Wickes-class boats with Yarrow boilers were scrapped or expended as targets in 1929; ten years or less of service had worn out their machinery and with over 200 similar destroyers still on hand there was no incentive to re-build them. Seven others were lost in a mass stranding on the California coast in September 1923. The London Naval Treaty of 1930 limited signatory nations’ total tonnage of destroyers, and when the U.S. began to build its Farragut class in 1934, flush-deck destroyers had to make way for them. Thirty-five more were scrapped between 1935 and 1937 to comply. 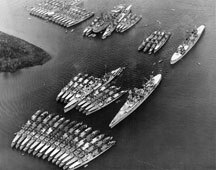 When war broke out again in 1939, the U.S. Navy had 168 flush-deck destroyers in its inventory: 120 of them in destroyer configuration, and another 48 that had been converted to fast minelayers or small seaplane tenders. ’23 Skidoo. Destroyer Squadron Seven aground at Point Honda, California. Of the fleet destroyers, fifty were transferred to the Royal Navy in September 1940 for conversion to long-range escorts. On the 70 remaining, 27 served in three Atlantic Fleet destroyer squadrons and 13 in the Asiatic Fleet. The other 30 were assigned “other duties” which included training submarine crews. A flush-deck destroyer, Reuben James, would be the first American warship sunk in World War II. By the end of the war, most of those still in service had been converted to fast transports, minesweepers or minelayers. The last of them, Hatfield, was retired in 1947. Nine originally sent to Britain served under Soviet colors until the early 1950s; one (Stewart) was captured by the Japanese in 1942 and served the Imperial Navy as a patrol boat before being reclaimed in 1945. Clemson- and Wickes-class destroyers appear in the Great War at Sea game Plan Gold. The difference between them in game terms is solely based on fuel endurance; the Wickes-class counters also represent Clemson boats with poor fuel economy as the Clemson pieces represent Wickes-class boats with particularly good performance. Send these craft into battle! 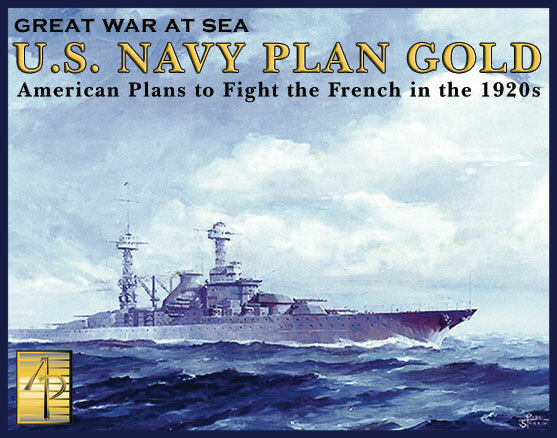 Order U.S. Navy Plan Gold while you still can!